Every dog needs training. Just like children, dogs are happiest when they know what is expected of them. While most people think of dog training as something you do with puppies, dogs can learn new commands at any age. 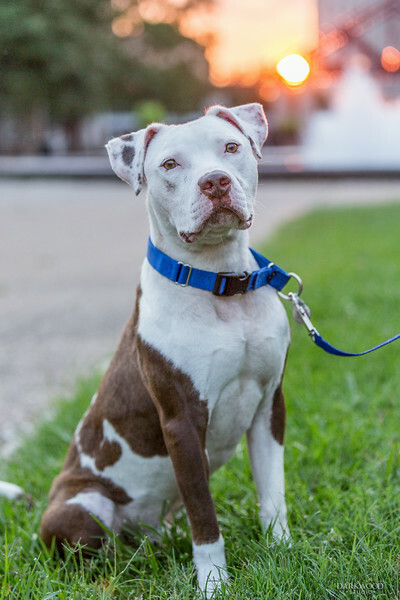 It’s especially important for dogs like Gilbert to learn some basic commands in order to help them get adopted and have that adoption be a forever one. DISCLOSURE: This post is sponsored by Zuke’s via OffLeash Communications. I received compensation and free product for this article. See full disclosure statement. Gilbert was rescued by Gateway Pet Guardians in St. Louis, MO. Gateway rescues dogs in the impoverished communities of Illinois just minutes from downtown St. Louis. There are hundreds of dogs living on their own on the streets of East St. Louis or hoping to make it out of the animal control shelter. Gateway rescues as many of them as they can. Gilbert was abandoned by his owners and found in East St. Louis tied to a tree. He was taken to a very overcrowded animal control facility where sadly many of the dogs never find homes. Gilbert was one of the lucky ones. Gateway Pet Guardians rescued him and is working to find him a forever home. 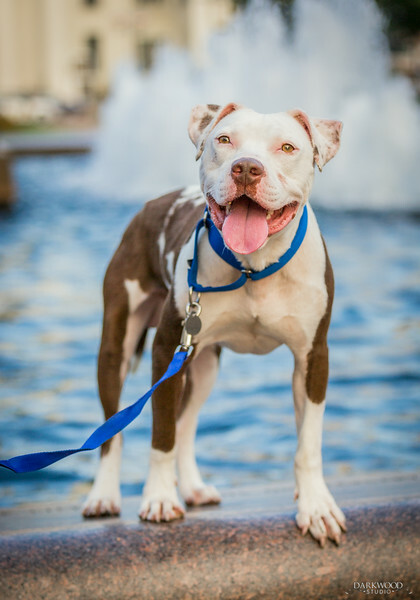 Gilbert is a pit bull mix with a huge smile. When I walked through the Gateway shelter where they house dogs waiting for a foster home, it seemed like every dog started barking. But not Gilbert. He just sat at attention and locked his eyes on me hoping I would come over and give him some love. To his surprise, he not only got to go out into the yard with me and another volunteer Melissa, but he also got a few handfuls of tasty Zuke’s Mini Natural treats while he learned some new commands. Since the video was made, Gilbert has been adopted! 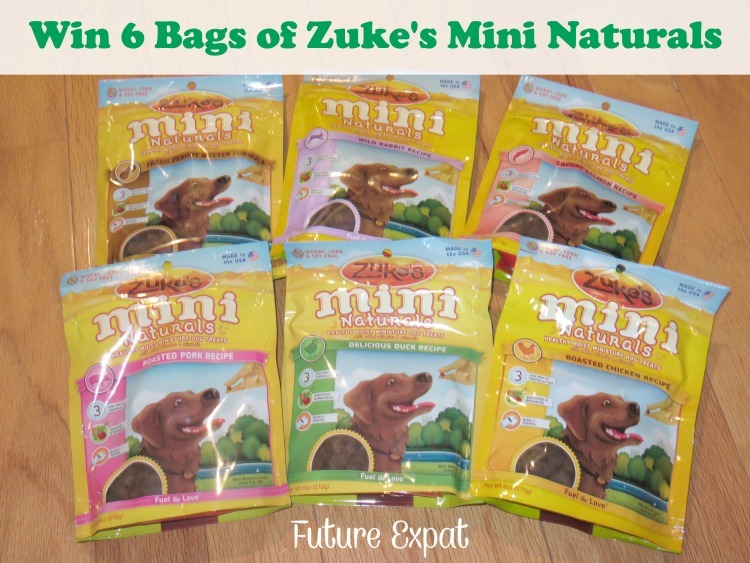 Zuke’s is giving one of my readers a chance to try all 6 flavors of their Mini Naturals Dog Treats. The winning reader will receive 36 oz of Zuke’s Mini Naturals. Flavors include: chicken, pork, duck, salmon, rabbit and peanut butter. This giveaway is over. Congratulations to our winner, Kristie Donelson of Ohio. I love bringing treats on walks to help reinforce good behavior. I hope Gilbert finds his forever home. My favorite use of small treats is training my pit Roxy to stay in the truck until released. It keeps her safely out of traffic and allows me to be ready before she gets out. I signed up for weekly emails for a extra entry. OMG Gilbert is gorgeous! Not entering the giveaway since I don’t currently have a dog – but love the video! I love using small treats for training and when my dog showed good manners when a guest comes over to our home. My dogs, Raven and Bella love Zuke’s minis. They’ve only tried the chicken and the peanut butter though. I hope we get to try the other flavors too! My favorite use for small treats is training. They’re also good to take to the lake with us. I give them treats when distractions arise and I need their attention on ME! We love Zukes! We use small treats for training but our favorite use is putting them in our dog’s treat ball. We just got a dog about 6 weeks ago. Wow, we’re all adjusting. We use small treats for rewarding positive behaviors. She loves treats. We just started puppy kindergarten and Zuke’s are PERFECT for this! https://twitter.com/karenstl/status/511625265106386944 <<<< I retweeted her tweet. 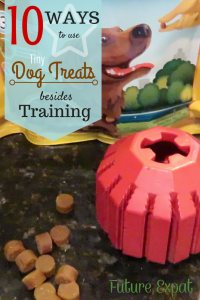 We use small treats for training sessions to reinforce commands our pups already know. What an awesome post! Love Gilbert – he’s such a handsome man-dog. Thank you for sharing his story with us. Thank you for joining our Thankful Thursday Weekly Blog Hop while we have been travelling. my favorite use for little treats is training, we just learned to roll over, it took a lot of treats! I confess – we use treats just because shes so darn cute! We use treats to reinforce good behavior. Works great on our black lab! Great story, and a wonderful giveaway!! Right now we are using treats for walking on the leash training. I won’t be entering the giveaway as I live in Canada, but I love using Zuke’s and other small treats to train my baby girl “Little”. We’ve done all of Zuke’s flavors except Chicken (Little has a chicken allergy) and she’s pretty happy to get them. Right now we are using them to learn to ride a skateboard and as a reminder to walk beside me when we go for walks (I got lazy and started letting her not, working on getting back to how it’s supposed to be), no pull, loose leash. They work great, and the best part is that I don’t have to cut them in half when I’m using Zuke’s as they are the perfect size for training. We use lots of treats when training so the smaller the better for me. I can’t seem to teach Milo to even lay down. Can’t imagine teaching him to ride a skateboard! What a beautiful boy Gilbert is! I love using these treats for clicker training sessions and just as an occasional treat when I feel like giving my fur babies a little something extra for a snack. I have two puppies so I am using small treats for training purposes right now. I need more. We love Zukes! Small treats are great for training our MinPin and for little rewards for good behavior throughout the day. I would love to say that I use treats to train mh dog but the truth is I use treats to spoil my dog. I use small treats to reward my pup for good behavior. I subscribed to your weekly emails! I use treats for tricks, sit, shake, down, etc. I use treats as a reward for good behavior from my GSD pup. We use treats as a reward for tricks. I signed up for your emails. Thank you! We have a six year old boxer and a 1 year old rescue dog. We use small treats for positive reinforcement. Our rescue dog is a terrier mix and loves to jump…my children have been teaching her to jump through a hula hoop and the treat is a nice reward! I am a new email subscriber! I enjoyed reading this post and look forward to more. Hi, we are back again, zooming to every pal’s site from last week’s Thankful Thursday Weekly Blog Hop. Gilbert is such a handsome man-dog! Thank you for joining our Thankful Thursday Weekly Blog Hop last week. Hope to see you gain this week because we always enjoy reading your posts. Small treats are great for all kinds of training! I love to use small treats when trying to train a new trick, so they are attentive but don’t get full. I use small treats for going outside to the bathroom and for good manners towards other people. Oh, my goodness! I”m thinking good thoughts for Gilbert’s heartworm treatment — he looks like such a nice guy! Our little dog loves little treats, and she gets a couple a day, usually as a reward for doing something right, or to reinforce some attempt at training. She’s not brilliant, but we love her. Just for being good, an extra snack. They are great for cutting nails and helping to sit still you give one after each paw! I take a treat on our walk. Bailey knows that it is in my pocket. He doesn’t waste any time doing his business because he knows when he finishes that he gets a dog treat. I use them to help my dog stay still when we wait to cross the street. We use Zukes for training and we also put them in a kong. We use them as a positive reward when he does something good like a trick or going in his cage. I use small treats to bribe my dogs to come into the house or to be quite, etc. We use them to train him…like last time we trained him to not jump at the front door when someone knocks. My favorite use of small treats is for teaching puppies the basics. Zuke’s is our favorite! Haven’t tried all the flavors though. My dog is pretty well behaved. We use treats whenever she does tricks or just as positive reinforcement. We love using small treats to assist with training. Gilbert reminds me so much of my sweet pittie that we rescued last year – he is very, very food motivated so I always have a pocketful of treats to reward those good behaviors! My 3 Chihuahua’s get treats just because I love them ! I use small treats as a reward for going outside to the bathroom. My little dog gets treats because I love her so much! We LOVE the Zuke’s brand! This doggy is so cute and I love his training video! Thanks for sharing this with us at the Teach Me Tuesday Linky Party. Every night, my parent’s dog gets a handful of “night night cookies” when she goes to bed. I love the little ritual and how happy it makes her! We have a 7-year-old, a 9-month-old, and a 3-month-old; we could sure use the treats for training 🙂 Two of them are rescues, and we also foster. I also pet sit, dog walk, and board dogs. Needless to say, treats are always needed. Zuke’s are one of my favorite brands! I liked you on Facebook as Garage Saling, but it kept saying “error” whenever I tried to share the status. http://www.pinterest.com/kortamaosu/ I pinned on to my “Animals” board. I’ve signed up for email updates. 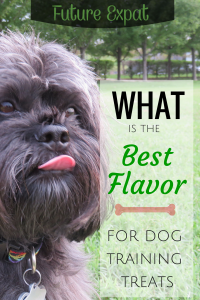 We use treats for good behavior and “just because”! I like to use small treats when trying to teach a trick. kristiedonelson(at)gmail(dot)com Thank you. Subscribed via email. kristiedonelson(at)gmail(dot)com Thank you. Follow on Pinterest. Kristie Donelson. I use treats to teach my dogs to sit stay…it’s slow but it’s going well. We love small treats for training! They are just perfect. I use dog treats to reward good behavior. I like using small treats as a tiny tidbit of extra affection and attention! I subscribed via email as bkittie at gmail dot com! I like to use them to play hide and seek with my pup. I used Zuke treats training my dog to become a therapy dog for hospice patients. He loves the peanut butter ones especially! The Facebook Share Status says it cannot be found??? The giveaway actually ended already. I need to go back and edit to make it more clear since I guess everyone doesn’t read the rules paragraph. Sorry for the trouble but glad you stopped by. I love Pit bulls, they are the cutest smaller dog breeds. People have trained them to be mean, but I think that the nice ones can be super loving. My wife and I want to get one as a family pet that can be an appropriately behaved guard dog for our disabled son. He needs a little buddy and I think that a dog would be just the ticket.